Two vintage fashion fans based in Tallinn, Estonia, have put together a small range of refashioned blouses "Upcycling & Design by Paula Pärnaste", which can be seen on Sequin Magazine. 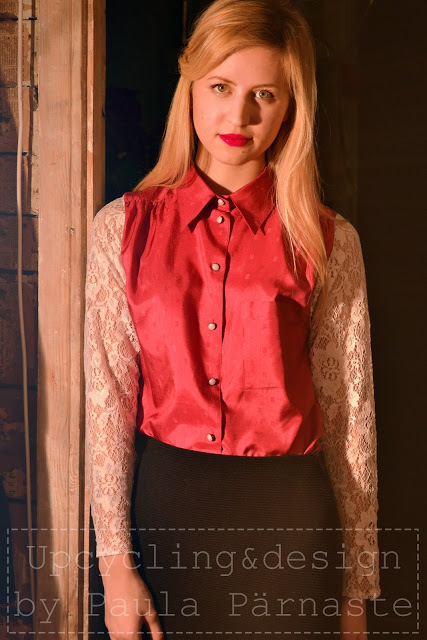 Paula Pärnaste adjusts second hand blouses, and introduces pretty lace sleeves and collars, which can be seen modeled by her friend Merily, on her fashion and lifestyle blog Sequin Magazine. Blouses are for sale here. 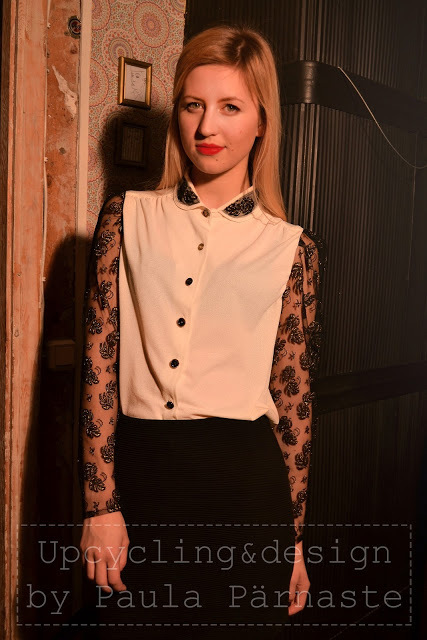 A Paula Pärnaste blouse would be a nice addition to a winter outfit, to be able to wear longer sleeves during cooler months, but with a lace finish which is usually reserved for warm weather. You could style these shirts with simple basics such as a pencil skirt or trousers for a smarter look as seen above, or wear with jeans or jean shorts to add a little femininity to a casual outfit. Merily tells me they're about to launch an upcycled menswear line SWÄRK in upcoming months which I'm excited to see. Tallinn, Estonia is home to another recycling artisan, Pavel Sidorenko and his amazing upcycled vinyl clocks, seen here. These are really pretty and great idea for upcycling, I love lace!! !